Both vegetable and shrimp tempura are favorites with their lightly fried, crunchy batter and perfect dipping sauce making lunch or dinner a delightful meal. 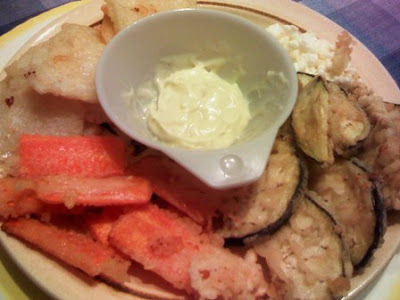 We tried to make vegetable tempura at home one time, and were delighted to find it so easy to make! The dipping sauce, however, is something that's more difficult to replicate and so we have an alternative: mayonnaise-wasabi sauce. Surprisingly, the sauce itself was yummy! I can imagine using this sauce on other stuff, like salads and burgers for that unique, tangy flavour! 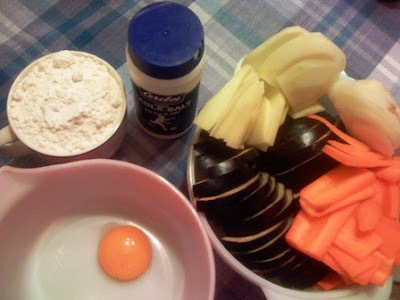 For this batch, we used an eggplant, potato, and carrot, all medium-sized. This being my first time to make tempura, we were not sure if this will succeed and so we chose these three which we can still salvage if it doesn't work. These were thinly sliced (but not potato-chip thin!) so it will cook quickly just as the batter has been fried to a crisp. Beat the egg yolk in a bowl. Add the cold water and continue mixing. Mix quickly but gently; it is not needed to be thoroughly mixed. Add the ice to keep the batter cold. 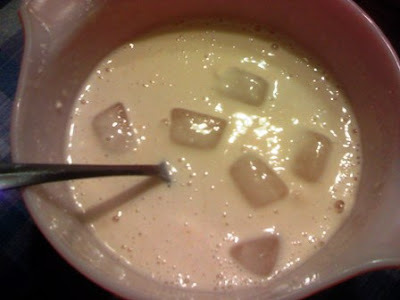 If you are not yet going to use the batter, do not add the ice. Instead, keep it in the ref and add the ice later on. Simply mix the mayo and the wasabi together! You end up with a light green dip that tastes awesome! Heat up a generous amount of cooking oil, which must be deep enough for the veggie slices to be able to float around. To test if the oil is ready, put a few drops of the batter into the oil. If it takes a brief dip into the oil and then surfaces immediately, then the oil is ready. Dip a veggie slice into the batter, then put into the hot oil. You can cook a batch, for as long as they do not touch each other as they cook or else they would stick to each other. After about three minutes or so, remove from the oil and place on table napkins to absorb the excess oil. Serve immediately with the dip. We thought three vegetable items will be consumed in one go, but we were wrong. It was too many for two people! We had a second batch after this. So this serving is good for 3-4 people! 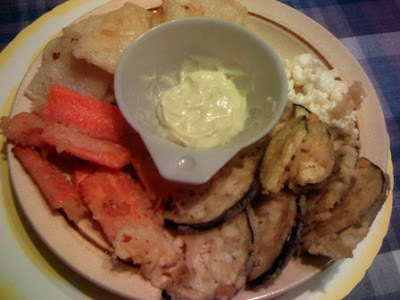 Be sure to serve immediately because the tempura becomes soggy and loses its crunchiness when it stays out too long.